What's the one thing - on or off - that immediately telegraphs your design tastes to every visitor in your apartment? Why, lamps and light fixtures, of course. Whether you crave the unusual or the more mundane, lighting is one of the easiest ways to personalize your rental to your taste. So, consider one of these two lights - one sweet, one sour. The combination of these unique light fixtures is sure to say you have an appetite for refined culinary design. You can't get much sweeter than a light literally made of sugar. 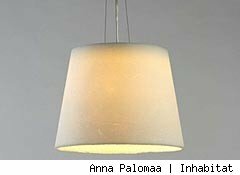 Finnish designer Anna Palomaa has taken that inspiring material and created the shade for her Kide Lamp. When switched on, Palomaa's light looks like sparkling snow - no doubt inspired by the Finnish winter. Beyond it's gorgeous simplicity, another bonus is that the lamp shade is completely biodegradable. This light is powered by... lemon. Yes, this unusual light runs on the bio energy produced by half of a lemon. 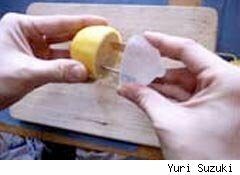 In fact, it plugs directly into the lemon to work. Japanese designer Yuri Suzuki says that it illustrates the amount of energy we use and take for granted every day. The light emitted is rather weak so your lemon light can't be used as, say, a reading light. It will also need a new lemon when the juices of one run out. However, your lemon light is sure to be a conversation piece next time you have someone to dinner. Contact Yuri directly to get one. Sweet, sour, and totally delicious design! If you still want something unusual, check out the purely sweet gummi bear chandelier.